OK, I’ll take my chance and throw myself in the water from the high springboard: Voříšek’s Fantasy op. 12 is a true and unknown masterpiece (I think the composer’s name is pronounced Vodjitchek). I’ve listened recently to various works by “minor” composers (e.g. composers not usually recognized as “major” ones), like the Sonatas of Cimarosa, some of Clementi played by Horowitz, or the Chamber music of Scharwenka, and I’ve found them very good, deserving much better than their relative neglect; but they always invited comparisons with the music of “major” composers: those of Cimarosa with Scarlatti’s, Clementi with Beethoven, Schwarwenka with Schumann and Brahms; and the yardstick of their value is that, to my ears, they were not so inferior to their models. I won’t say that Voříšek’s Fantasy didn’t invite such comparisons. It is somewhere between Mozart’s two Fantasies and the best of Beethoven’s Sonatas (not that there is much of a “not so best” of Beethoven’s piano sonatas), with a romantic turbulence and agitation that evokes Beethoven (the finale of the Moonlight Sonata often comes to mind in the second, agitated section) or the more turbulent moments in Schubert’s Impromptus and, in the Bellini-like figuration of the right-hand in the slow introduction, whiffs that might evoke Chopin. But very soon, such comparisons seemed otiose, and I listened to the music and its beauties on their own terms. Although composed after the Fantasy and bearing the opus number 20 (according to some Voříšek specialists it may be his last piano composition), the Sonata is maybe not on the same exalted plane. It is more archaic in form – it doesn’t have a slow movement, its middle movement being a scherzo – and its emotional content points to early rather than late Beethoven or Schubert. It is a fine work in its kind, and hearing it with the score – all the compositions featured here are available on the International Music Scores Library Project, bless again those who uploaded them, although the Sonata is in a slightly different edition than the one played by Pizarro – has only enhanced my appreciation of the work and interpretation; but, as excellent as it is, it doesn’t have these unique melodic or harmonic twists that catch your ear in the Fantasy and make you think that you are hearing something really special. The Variations op. 19 have a hard time recovering from the deceptively simple theme that provides their point of departure and melodic underpinning, one that you’d easily expect would have caught the fancy of a 9-year old Mozart, although, listening again with score, that theme is very cleverly varied, and when the piece reaches its end, after 6 variations, it makes you regret that Voříšek didn’t write 33, like Beethoven’s Diabelli. Given the Schubert reminiscences in some of the previous works and especially the Fantasy, it is fitting then that Vorisek also wrote a set of six Impromptus, op. 7. Again, on first hearing, some of them might sound deceptively simple and probing no great emotional depth, more superficially playful than Schubert’s own impromptus and evidently influenced by Beethoven’s Bagatelles op. 33. But in fact, listening again with the score has again entirely changed my appreciation even of those I had found lightweight: for instance, there is, in the first one, a contained, un-flaunted nostalgia that evokes not only Schubert but even the dreamy side of Schumann. The 4th starts with an agitated, Schubert-like right-hand accompaniment in triplets to the main melody, and its trio section at 4:03 features a delicious “music-box” passage, and the 6th starts with a quasi-tremolo of fifths that again evokes the rich harmonic world of Schubert’s Impromptus, or the short, hazy shimmer that opens Beethoven’s Bagatelle op. 119/7. The impromptus are full of felicities and, with a duration of 6 to 7 minutes (when all the repeats are played, as Pizarro does), there are also substantial works in the form, not just mere trifles. Artur Pizarro made a few valuable recordings for Collins Classics after his victory at the 1990 Leeds Piano Competition, and now records for Linn Records and Naxos. Here, in Voříšek, his playing is, overall, exceptional. Not only is he extremely precise in his observance of Vorisek’s nuances, articulation marks and, most important of all, silences. But, compared to some of the competition (Radoslav Kvapil on a 3-CD set, Supraphon SU 3747-2 113, and Olga Tverskaya on fortepiano, Opus 111 OP 30241), he has incomparably more subtely of touch and poetic imagination. His readings are, truly, revelatory. See my reviews of the two competitors to know why. Only perhaps in his statement of the theme of the variations, taken too slow for this simple music’s own good, can Pizarro’s sense of tempo be questioned, although he makes up, and by far, in the ensuing variations. The CD’s TT is a generous 74 minutes. 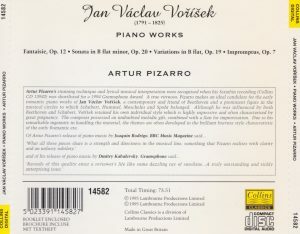 Pizarro recorded for Collins a Vorisek vol. 2, 14772, and both volumes have been reissued in 2011 on a 2-CD set by Piano Classics, PCLD0009.